Discussion in 'Tutorials and How Tos' started by REDLINE, Jan 28, 2008.
alright, thrust is finished! unfortunately I had already finished the tailwings before deciding I was going to do this write up, so I'll have to explain using the finished pictures. MAJOR EDIT--I was finishing up some paint, and without realizing it, I was holding onto the end of one of his tailfins. and the epoxy peeled away, as if it wasn't dry yet, a week later. I don't know if I didn't mix it well, or if it was just the type of epoxy it was, but I seriously doubt the strength of the epoxy I bought. so out of curiosity, I peeled off the rest of the epoxy on that wing and tried supergluing it. stuck like a champ. I guess consider this a caveat. so starting with your ramjet. he's probably already a bit hacked up if you did the dirge first and cut off the top of the rear tailfins. you'll also want to remove the small side wings/fins. they're not glued in, but can be difficult to just pull out. I used the drill bit mentioned above, and just went in from the inside and drilled it right out. the drill bit's a hair larger around than the hole, but that's ok because you need to make the hole a tad bigger anyway. now for the partial removal of the rear wings. 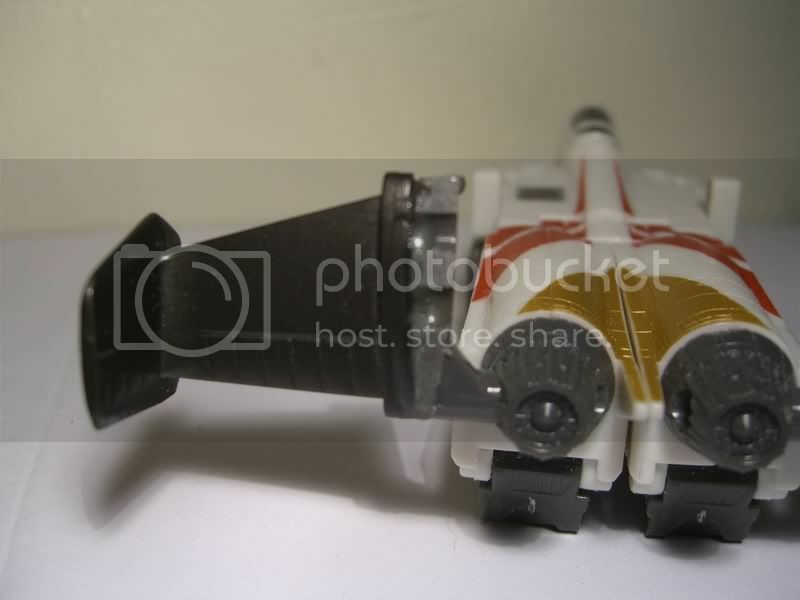 again, the top of the tailfins are probably hacked off at this point if you were using them for dirge, which is good because they'd just get in the way. DO NOT just cut off the whole wing assembly, because you're going to use a very small part of it to attach the g1 tailwings to the body. what you want to do is to remove the two screws on the inside of the rear thrusters, which will allow you to remove most of the rear wing. what you'll be left with is the inside half of the rear thrusters. I'll use these pictures as a reference point. 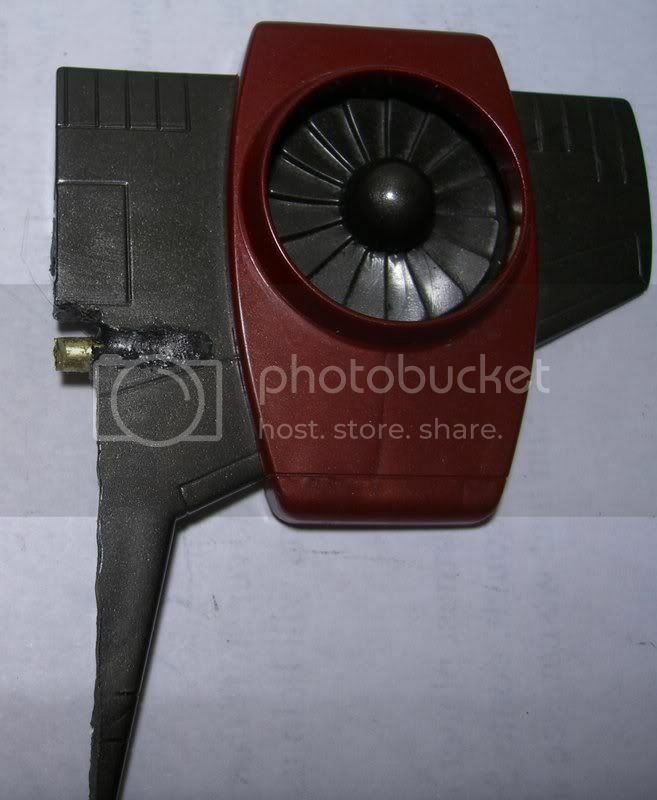 you are basically going to remove the rest of the thruster so that what you are left with is the peg that is coming out AND about 1/8 of an inch of the inside of the thruster as an attachment platform for the g1 fin. I used the sanding bit for all of this, because if you cut too far, you're screwed, and I feel you can take off small increments easier with a sanding bit. 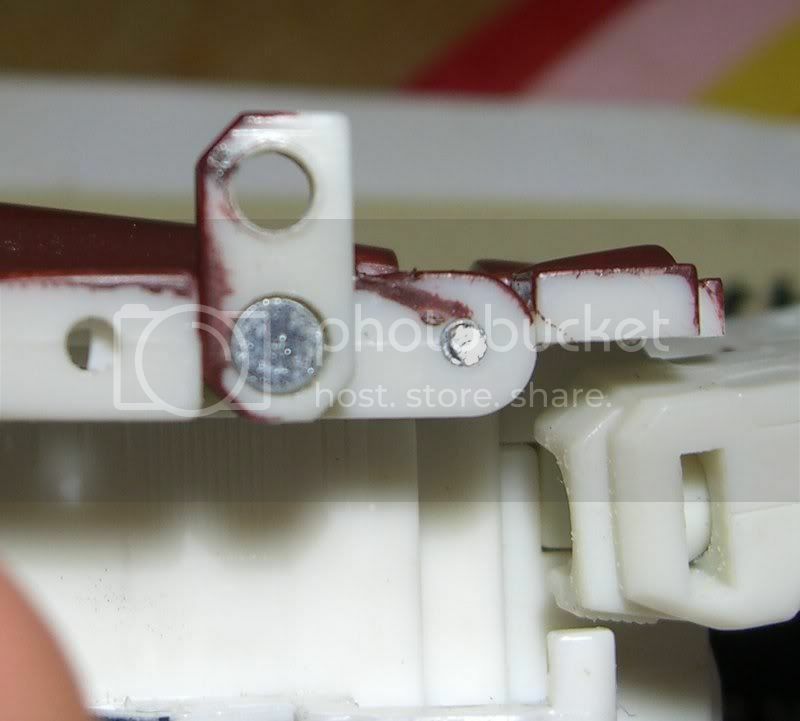 if you look at the detailing in the thruster, you'll notice a bit of a rectangular box around the screws you removed. I sanded away the thruster up to one of those boxes, you can take your pick, depending on how thick you want your attachment point to be. once this part is sanded down to the appropriate thickness, you will want to now cut it down to the right height. 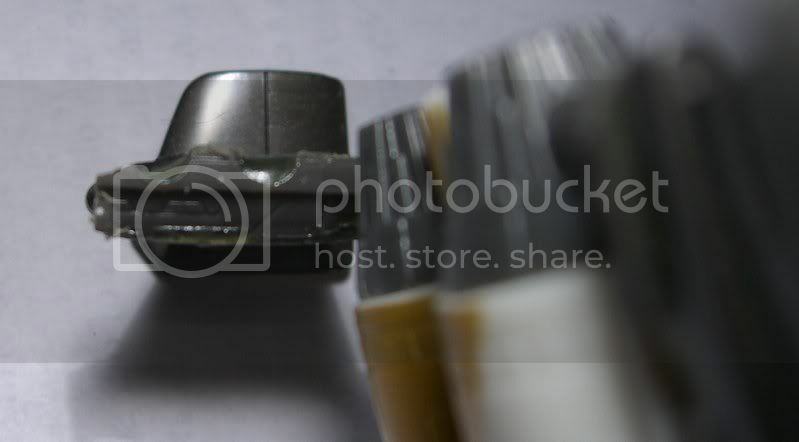 I simply used the cutting wheel to remove most of it, then the sanding bit to get the top of the thruster bit even with the top of the peg that attaches this whole bit to the figure. from this point, you're left with some scarily thin pieces of plastic compared to what you originally started out with. but don't worry! 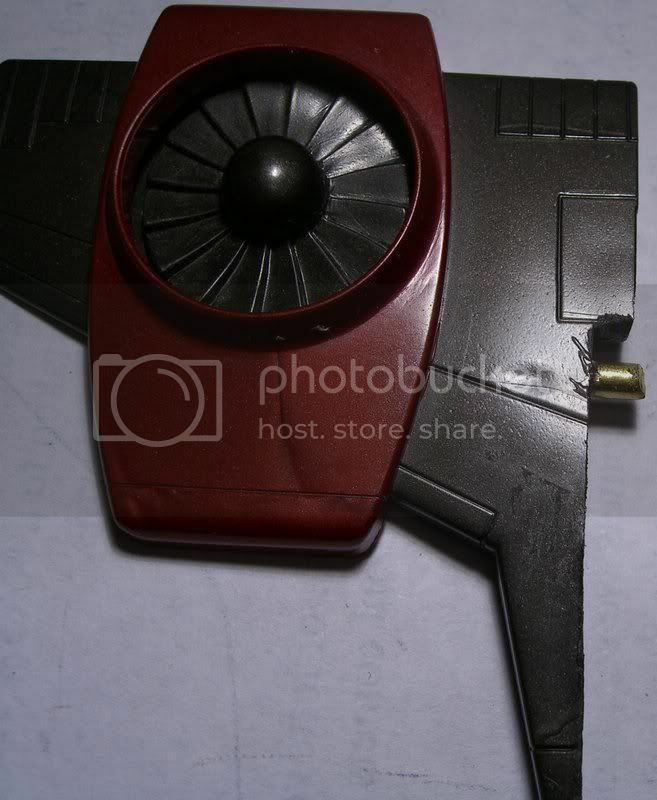 once you get the g1 wings attached, it'll be nice and sturdy. so how do you do this? simple! just grind away the pegs on the g1 wings so they're nice and flush, and epoxy away and you're done! now for the tricky part. my loss is your gain. 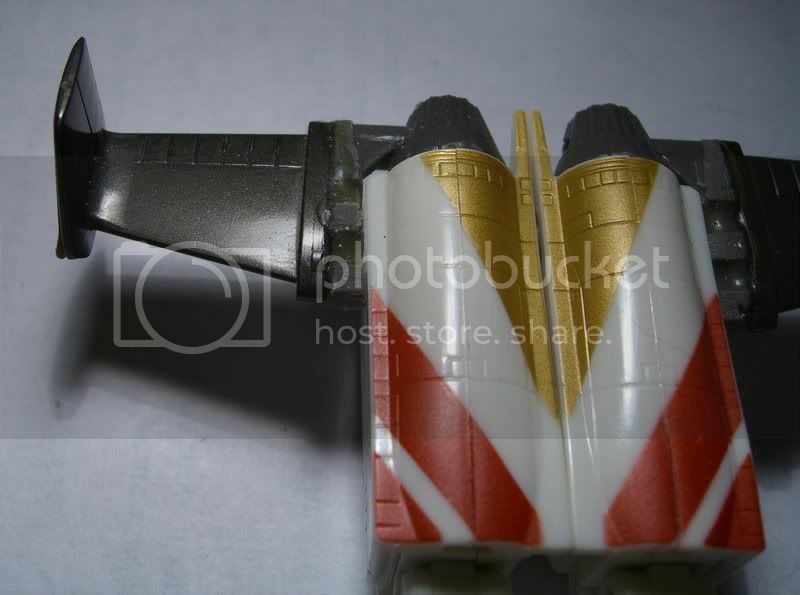 we are going to cut away some of the interior side of the g1 wings, drill a hole in it, and then epoxy in some of that brass rod from the beginning to make a peg to attach it to the figure. I'll just show you my big goof to start off. I made the mistake of not realizing that the g1 wings flare out a bit on the inside, and thought that they were thicker than they were. so as I was drilling, I went through the surface of my first wing. I'll show you how I worked around this problem for the second one. so, to start with our cutting. this is where it gets nasty. this plastic smokes and smells awful. if you still have the wing stickers on, you might as well take them off, because you're going to be cutting away right where they are. 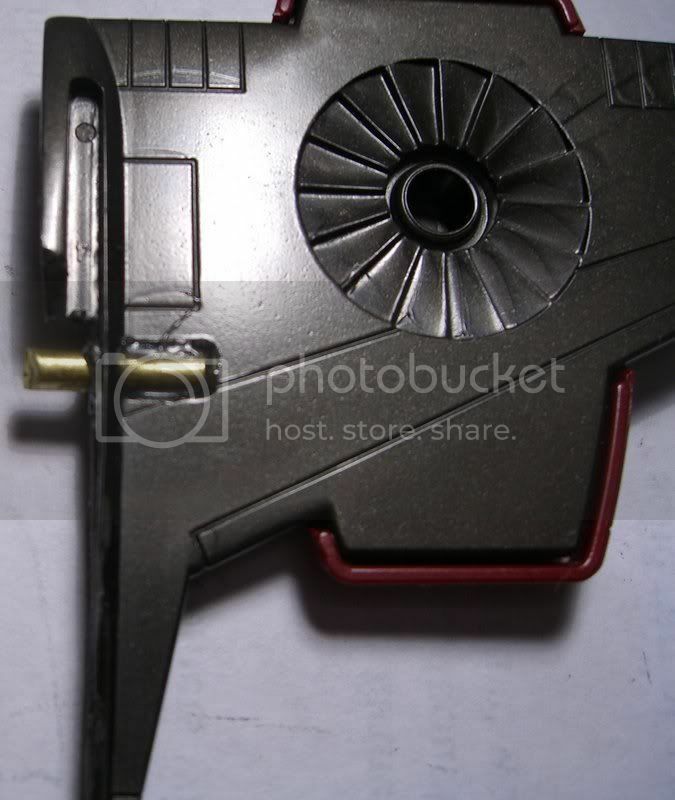 I started off by first cutting off the peg that held the wing onto the g1 fig. I then cut along the front line of the detailed rectangle on the top of the wing, from the interior edge towards approximately the center of the rectangle. again, use the picture above for reference. where the when you flip the wing over, you'll notice that the interior edge is sort of hollowed out. using the cutting wheel I stuck it inside and just cut away from the front to the middle of the wing, stopping at that little detail molded in rectangle. it's much better to use the cutting wheel here than the sander, because the flat surface of the cutting wheel will act as a guide, not grinding away any of the thicker plastic. at this point you will probably want to take your sanding bit to make things a bit smoother, just be careful not to grind away too much. you should now be able to hold your wings in place to see how they're going to look when you're done. and now for the tricky part. you're going to have to CAREFULLY drill a hole into the edge of your precious, probably ebay-obtained wings that you just spent an hour cutting and sanding. you might want to hold the wing in place where it's going to go, and then stick a pen through the hole to make a guide mark on the wing. now the big kicker here is that the drill bit and rod that we're using is 1/8", but the thickness of the wing is just a hair thinner. so you can probably figure out what's going to happen. as you're drilling through, the drill bit is going to remove plastic where we don't want it to. I suppose technically you could get a thinner drill bit and thinner brass rod, but my eventual solution I think works just fine. 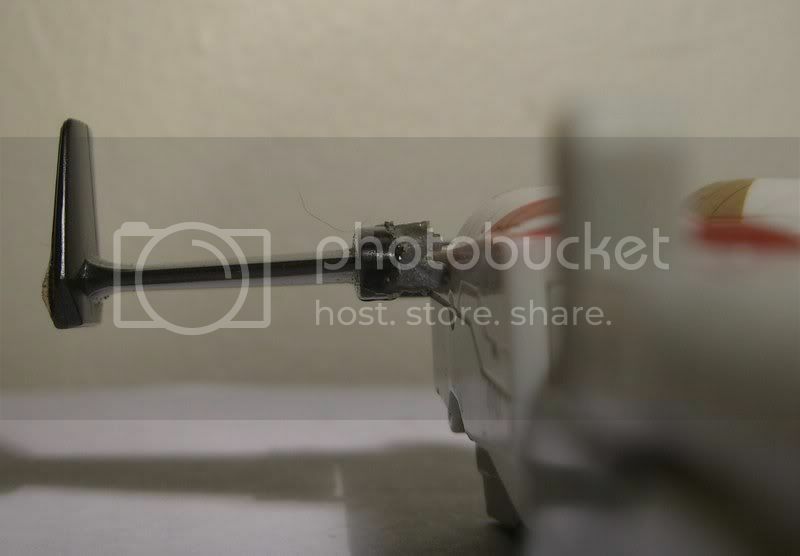 so when you have your mark on the wing, you want to drill about as deep as the inside edge of that detailed rectangle that I've been making so much reference to (helpful little bugger, ain't he?) but you don't want to start drilling with your bit in the center of the edge of the wing. have it offset towards the bottom just a little bit, and start drilling SLOWLY. this will allow you to keep enough control over it to prevent it from coming out of the topside. use the above two pictures to help you figure out where I stopped drilling, and probably where you want to stop too. now like I said, this plastic is gross, and it'll be smelling to high heaven. also, some of the shavings will probably melt and resolidify, so get them off when you see them to make things easier for yourself. you now have a nice little hole to put your brass piece in once we make sure things are all set. I cut a 13 mm length for mine, which is not essential, but basically you want it to fill up the hole on the ramjet body and the space you just made. set the rod in there, and attach it to the body to make sure things line up just right. if the hole you drilled was too far forward or back, don't dismay. 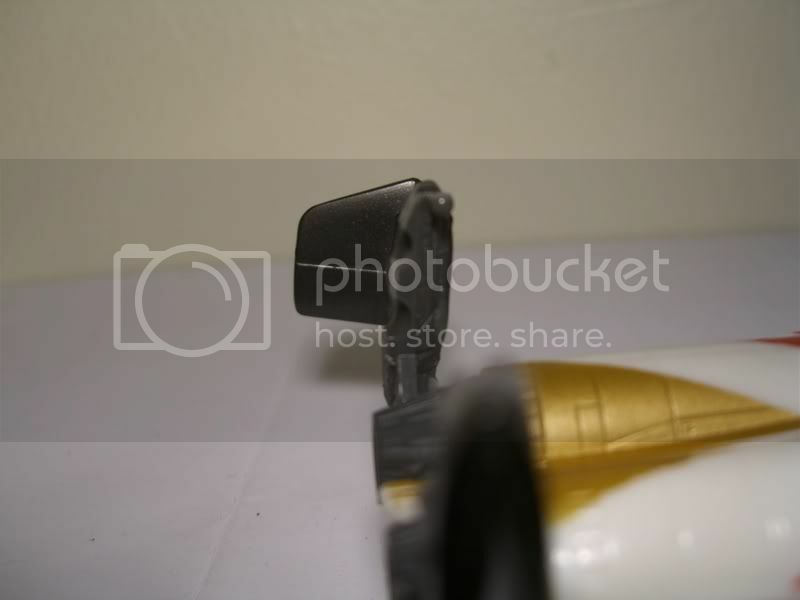 you can insert your drill and then slide the wing a little to make slight changes in the width of that hole. you'll be filling it up with epoxy anyway. because at this point, all you need to do is to put some epoxy in the hole you drilled in the wing, and insert the brass pegs, and you're done! after a day with this drying, the peg should be nice and sturdy and not rotate. 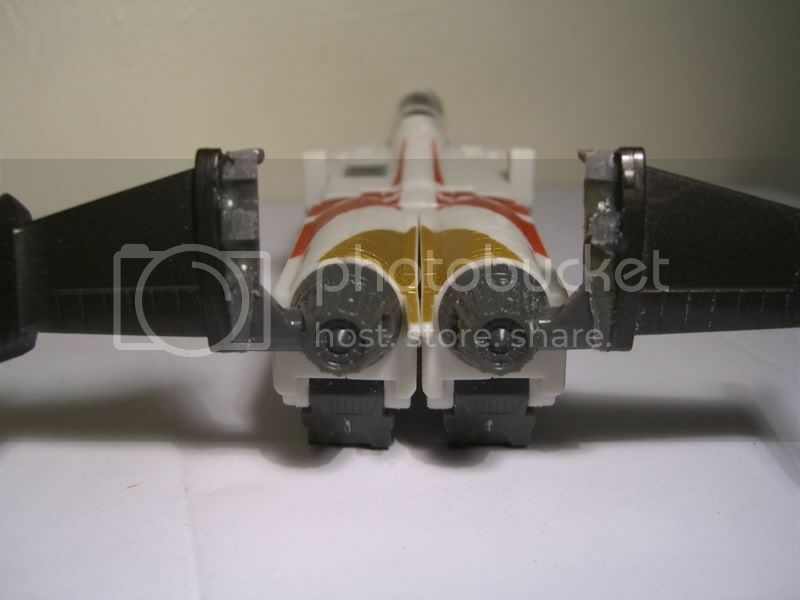 you can then just insert the wings into the ramjet body (drilling the hole if you need to so that the peg fits) and you're done!